Professional online website builder is complete website creation tool that offers everything you need to build a website: ad-free hosting, free domain names, website templates and website design, CMS, eCommerce and Real Estate solutions. Make your own website today, create a website in minutes: turnkey solutions from a Personal Website to a big Online Store. Try it now for Free! Make your own website for free, no matter what your level of web design and website development skills. Build a website with all the great features you see on the big corporate websites in just few simple steps - create a free website today! 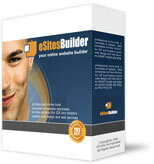 The eSitesBuilder Online Store building system helps you create an eStore for your business, complete with credit card processing and hosting, with no programming knowledge or website building experience. Our software gives you far more than just a storefront. It gives you sophisticated, high tech features that enable you to promote and manage your internet business and monitor your progress in a variety of ways. If you have an idea to create a fully featured website with complete information about your company and/or your business - create a Business Website Now! If you need a simple and straightforward website to display information about yourself, your resume, share your hobbies, ideas, and passions the Personal Website is the most easy and affordable method of achieving this goal. No website-creating skills are needed. You can create a website by yourself! Stunning and professional website templates with complete website features will allow you to build a website in minutes. We have worked with Realtors, Agents, and Companies hand-in-hand to build this fantastic and unique Real Estate Website software. Your very own professional quality Real Estate Website is just a few clicks away! Designed for Realtors from the most novices to the most creative to create a professional website for your Real Estate Business fast, quickly, and done right! In case you'd like to make your own website with using our website builder software what kind of turnkey website is going to be? Make your own website with combination of powerful and ad-free web hosting, easy-to-use free website building software, professional website design templates, and free customer support. Get everything you need to easily create your own website for your business - turnkey website building solutions from personal website, to real estate and ecommerce software.